So…. I thought of a bike trip after New Year. This time taking my wife on the trip. So I was thinking something short in distance something less than 150 km, then Ooty comes to my mind. Then we both decided to go on a trip from Coimbatore to Ooty. It is a weekend trip, we just decided 3 days before, so no big plans. Since it is the weekend, I know most of the hotels will be booked. So, I searched for decent hotels under 3k. After reading reviews from Tripadvisor and Google I booked Hotel Lakeview. I managed to pay around 2.5k after applying coupons from MakeMyTrip. 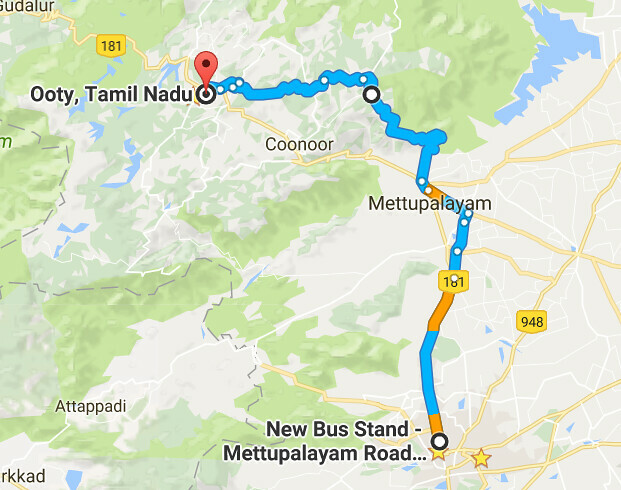 There are 2 routes to reach Ooty from Coimbatore. The second route takes 15 km more, but after some research, we still decided to take the Kotagiri route. This route has less traffic and good scenic view, though the distance is more. I recommend anyone to take the Kotagiri route than Coonoor route for enjoying the ride. Kotagiri route has 7 hairpin bends to reach Ooty. Here is the Google route map. I usually take my Yamaha Fz for all the bike trip but this time, I decided to take Royal Enfield. I googled and found some bike rentals from Coimbatore. I called and checked with almost all such rentals. But in most of them, Royal Enfield is already booked. Finally, I managed to book a Royal Enfield Thunderbird 500cc. It’s 1800 rupees per day and I have to pay 3600 rupees for 2 days. The price is little high comparing other bike rental services. But we had no other choice, so I booked it and asked them to deliver it by 8:30am. On Saturday morning after breakfast, we started at 10.00 AM from Coimbatore. Till Mettupalayam there is traffic but after that when we take Kotagiri road it is traffic free and very scenic. Here are some of the pictures on the way to Ooty. We reached Ooty at around 1 PM and checked into the Hotel. Hotel Lake view is one of the best hotels to stay in Ooty on budget. It is very close to the Ooty Lake, you can almost walk, though you will not get a lake view from hotel. Here are some of the pic from the hotel. After lunch, we decided to visit Ooty Lake and went on a pedal boat ride. It’s 140 rupees for 30 minutes. Since it is off-season, there is no much crowd and we truly enjoyed the ride. We visited Ooty botanical garden in evening. Here are some picture from the garden. Note the very small door in front of the temple. The priest used to sleep inside this temple. The priest uses only the buffalo milk for food. Buffalo milk is used in a variety of forms: butter, buttermilk, yogurt, cheese and drunk plain. Next day we dropped the plan to visit Doddaabetta. This place had some restriction since the Governor is visiting. It was also very cold in the morning and temperature reached 7 degrees. So after breakfast, we went for shopping. Ooty is famous for homemade chocolates, tea, spices and essential oils. We went to Tibetan market where you can get sweaters, riding jackets in cheap price. After shopping, we had lunch and started to ride back to Coimbatore.